Osmond Capital, the company owned by Hugh Osmond, best known for his involvement with Pizza Express and founding of Punch Taverns, is among those in the frame to buy high-end Argentine restaurant chain Gaucho. The group, currently owned by Equistone, first announced plans for a potential sale of its struggling sister chain Cau, for which it is financial liable for, in May. Advisors at KPMG were brought in to assess whether to close or sell Cau’s 22 restaurants. By contrast, Gaucho was said to be performing in line with expectations and was not at risk of closing. A Company Voluntary Arrangement (CVA) remains an option for Gaucho to be able to offload the Cau estate, and a failure to agree a restructuring with creditors over Cau could lead to the company filing for administration. 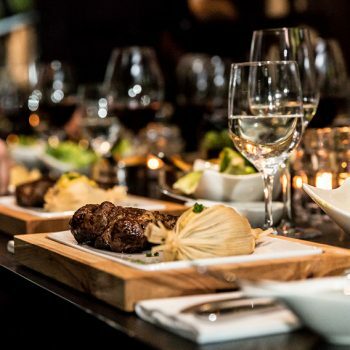 Now, Sky News is reporting that three investment capital groups, including Osmond Capital, Core Capital and Limerston Capital, are interested in making an offer for Gaucho, with Cau’s fate bound up with any potential offer. Sky reports that the three bidders are expected to offer less than the £50m owed by Gaucho to its lenders and that advisers at KPMG were trying to conclude a deal this month. The company’s founder, Zeev Godik, stepped down earlier this year and was replaced by Oliver Meakin, who joined from electrical retailer Maplin, which itself went into administration earlier this year. The group has 16 restaurants in the UK, and three international sites in Hong Kong, Dubai and Buenos Aires. It follows high-profile closures of restaurants in London, including several Jamie’s Italians, Carluccios and Byron Burgers venues, as well as Soho institution The Gay Hussar. Most recently 28°-50° Fetter Lane, the wine-focused restaurant founded by chef Agnar Sverrisson and Xavier Rousset, was sold to Cliffords Restaurant Limited. Last month, it was reported that the number of restaurants in the UK had fallen for the first time in eight years, according to new figures. Around two restaurants per week have closed over the past year to March, according to CGA’s market report, which predicts the number of sites across the UK will continue to fall throughout 2018.